You’ll recall that Metropolitan Water District (MWD) recently terminated a number of agreements to help fund local conservation and water supply development projects like the San Vicente Recycling project in Ramona and also decided against entering pending agreements to support projects such as the Carlsbad Seawater Desalination Project. 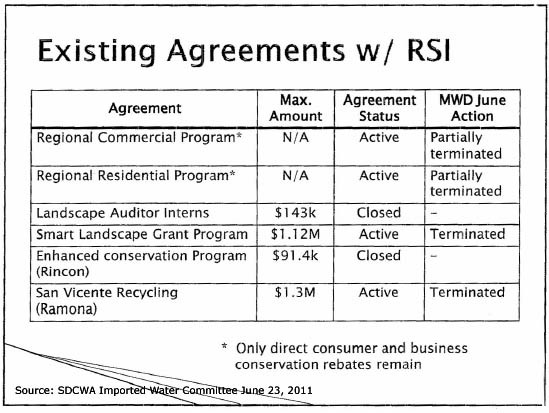 San Diego County Water Authority (SDCWA) has a big objection: MWD funds such conservation program agreements from its Water Stewardship Rate fee…and SDCWA’s contribution to that fund comes to a cool $22.5 million per year. Not fair, they say. SDCWA says MWD’s terminations amount to “retaliation” for a lawsuit charging that MWD’s water transportation rate structure is illegal. SDCWA says MWD’s rates are illegal in part because MWD overcharges for delivering water that SDCWA already owns, in effect subsidizing MWD’s State Water Project water. This circumstance comes about because SDCWA buys Imperial Valley water from Imperial Irrigation District and pays MWD a wheeling charge to transport to the water to San Diego Aqueduct pipelines via the Colorado River Aqueduct. What gets bundled into that wheeling charge is the question. The topic came up at this morning’s SDCWA Imported Water Committee meeting, part of a monthly all-day committee marathon culminating in a Board meeting. “SDCWA pays $22.5 million per year to support that program and receives nothing in return?” asked Director Doug Wilson. “Why don’t we just stop sending that money and keep it for ourselves?” That was met with silent agreement, but General Manager Maureen Stapleton cautioned that there would be complications with unilaterally stopping those payments. The letter was signed by Directors Jim Bowersox, Lynne Heidel, Keith Lewinger, and Fern Steiner. Director Lewinger lobbied that it’s time to begin a really vigorous public relations campaign and flood the county with updates and news highlighting the situation. * June 24: Someone told me they didn’t understand what the “betrayal” was. My take is that these are water management colleagues who are normally on friendly terms and the lawsuit puts them in a sensitive position, perhaps like someone choosing sides when a couple with whom (s)he is mutual friends are getting divorced. I guess Stapleton could have also replied that MWD was the Benedict Arnold by engaging in retaliation. 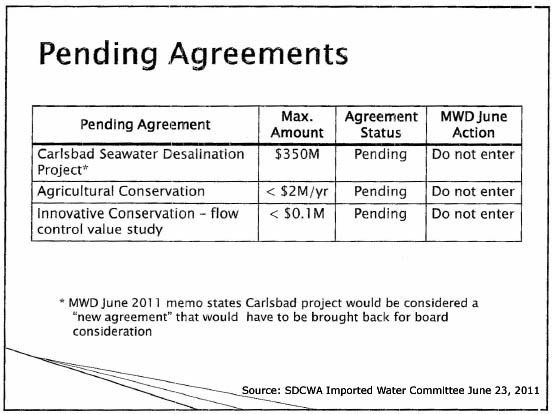 The following is from a handout provided at the committee meeting showing the status of the existing and pending agreements with MWD. This entry was posted on June 23, 2011 at 5:05 pm	and is filed under Carlsbad Desalination Project, Metropolitan Water District of Southern California, Poseidon Desalination Plant (Carlsbad), San Diego County Water Authority (SDCWA), Water, Water conservation. You can follow any responses to this entry through the RSS 2.0 feed. You can leave a response, or trackback from your own site. Whatever it takes to get Poseidon Resources out of the mix……DO IT!. Rate payers shouldn’t have to pay for this folly. They’ve led the horses to the water and now can’t get them to drink. There’s a reason. Its too expensive and this company doesn’t know what its doing. Consider yourselves lucky. Unfortunately, San Diego’s imported water supply comes from North and East and unfortunately for all of us San Diegans, the MWD is a squeezing octopus controlling all of the imported pipelines, valves and reservoirs between the water sources and us. In addition, San Diego has invested much capital in building relationships and infrastructure to deal with and accomodate the octopusl To make things worse, the northern aqueducts are vulnerable to catastrophic breaks that could cut off our imported water supply for an indeterminant time. Unfortunately, San Diego doesn’t get much water supply from up and down (from precipitation or aquifers). But a significant part of our expensive infrastructure is devoted to catching some of that local bounty. In addition to conservation, there remains West and South as a potential local sources for a big water supply. Fortunately, there is a lot of water out there. And fortunately, West and South are not within reach of the octopus. If we were to take advantage of West and South water supply (through LARGE seawater desalination programs) we would strand some of our infrastructure, it would cost a lot to build the plants, and we get some great water, and we would be forever free from the octopus!